Handmade paper is created with paper pulp and vegetable fibres. Handmade paper production for the gift market has increased over the last decade, with handmade paper being used as wrapping material, for stationery articles such as writing pads, photo frames, and calendars, as well as for packaging (especially for natural and eco-friendly products). Due to the increased demand for such products, the industry is placing greater emphasis on product diversification as well as improved packaging design. Market surveys indicate that plastic bags, which are not at all eco-friendly, are still widely used. Handmade paper using synthetically dyed paper is also a popular packaging material. Research has shown that most of the paper mill effluent is not eco-friendly due to the presence of toxic ingredients such as heavy metals arising from mordents like copper, chromium etc. This led the author to investigate the potential for the use of naturally dyed handmade paper as a viable alternative. Natural dyes are currently being used widely in the textile industry where designers have succeeded in converting what may be considered the flaws of natural dyes – the inconsistency in colour shades and the inability to reproduce a colour – into design features. 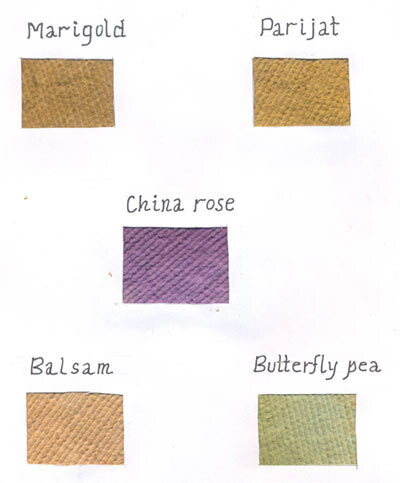 However, the potential of natural dyes has yet to be fully tapped by the paper industry. Further, floral dyes which fade easily and lack colour fastness could be used to great effect for colouring paper as durability through wash cycles is not a necessary criteria. Flowers, often used in paper production as an ingredient or decorative embellishment, are, as yet not used as a colouring agent. Synthetic dyes have certain major advantages over their naturally produced counterparts. These include ease of application, high degree of colour fastness, and cost effectiveness. However, the most prevalent processes for application of synthetic dyes require the use of mordents (chemicals having affinity for both dye molecules and fibre molecules, thus acting as a bridge between them). Potassium dichromate is the most commonly used chemical mordant. Chromium (VI), its primary component, poses various hazards to humans, and is known to affect the health of the male reproductive organ. As an effluent accumulating in water bodies where the dye waste is disposed, chromium also affects the growth of algae and small fish, leading to the depletion in their number and in some instances, even the disappearance of certain species. The process of manufacturing some synthetic dyes involves chemicals like sulphuric acid which generate toxic fumes, and certain arylamines that are carcinogenic. Further, when sulphuric acid is dumped in the water bodies, the pH of the water decreases. Certain synthetic dyes like azo-dyes (which use diazonium salts and amines) that have been found to be carcinogenic in nature have been banned by most European countries. Sometimes the synthesis of certain synthetic dyes requires chemicals that are known major pollutants like sulphuric/ fuming sulphuric acid. Due to international trends towards environmentally responsible manufacturing processes, there is a growing demand for an eco-friendly substitute for synthetic dyes – a niche that natural dyes can possibly fill. It was found that various flowers contain high quantities of colouring agents (especially in the corolla) such as anthocyanine or flavones either in free form or in combination with sugar i.e. glycosidic form. Most of the colouring matters present in the flowers are soluble in hot water and are non-toxic and can therefore be safely applied on suitable substrate like textile fibres, paper, etc. However, very little work has been done on the potential of flowers as a source for natural dye as floral dyes are not very colourfast and tend to both bleed and fade. Further, their availability is also limited by the quantity of flowers accessible, the time period suitable for collection of the dye-yielding flowers and the consistency of the colour produced per batch. Certain flowers such as roses and marigolds are widely cultivated as they are commonly used in large quantities for garden and pandal decor, as floral offerings to deities, in ritual immersions such as practiced in Ganesh puja and Durga puja, and as cut flower displays in home and office interiors. Other varieties of flower like the butterfly pea, China rose and balsam are used in substantial quantities as offerings. Hence, these flowers tend to be available throughout the year in sizeable amounts. Whatever their use, after the event they have been used for or when the flowers wither, they are thrown into waste bins or disposed in local water bodies, adding to the pollution of the rivers, lakes, ponds etc. A highly perishable commodity, flowers have a very short shelf-life resulting in almost 40% of the flowers in a local market having to be disposed of. Therefore, unsold flowers usually constitute an economic loss for cultivators and traders alike. If tapped appropriately, flowers, especially those that would otherwise have been disposed of, could be used as a natural dye source. 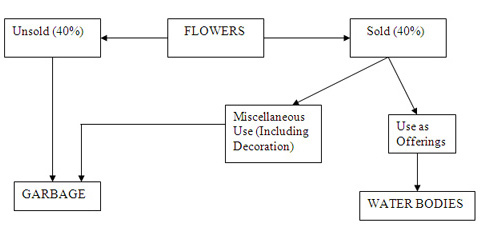 The recycling of waste flowers in this manner would prevent pollution, thus reducing the carbon footprint of the produced dye and dyed product. 20gm of flowers (only the coloured part is used) was added to 40 ml of water (1:2 :: flowers: water). After adding 1 gm of sodium chloride (5%), this solution was heated to 80o c for 40 min. This temperature was maintained because it was noticed that overheating caused the charring of the dye solution. After 40 minutes, the aqueous dye solution was filtered and the residual flowers were separated from the coloured solution. By dipping the prepared paper in the dye solution. By mixing the dye solution in the paper pulp. During experimentation with both processes, it was found that the dipping method did not yield satisfactory results and this method was therefore discarded. The alternative solution, mixing the dye solution in the pulp was found to yield a deep colour. This technique involves adding 20 ml of the previously prepared floral dye solution to 40 ml of paper pulp (paper pulp : dye solution :: 2:1) and was kept for 30 minutes at room temperature. A round piece of nylon net, about 2 inches diameter was cut, and then fixed onto an embroidery frame. The two parts of the embroidery frame were separated and the circular nylon net pieces were fixed on one of the circles. Thus, the nylon net pieces get stretched and form the screen for the paper formation. The lower part of the frame is the mould and the upper part of the frame which gives shape to the paper is known as the deckle. The dyed paper pulp was poured on the screen such that the paper pulp spread over the entire screen homogenously. To produce a smoother effect, a glass rod was rolled across the screen to spread the paper pulp more evenly and to squeeze out the excess dye solution. The paper pulp on the screen was then kept for drying in shade. After drying, the paper pulp, now in the form of a circular paper, was removed from the screen. solution (5% of sodium hydroxide) added in the ratio of 1:12 MLR. This was achieved by addition of alkali solution to 20 gm of shredded paper and 240ml of water. The mixture was left to soak for 24 hours at room temperature; it was then stirred with a mechanical stirrer under controlled speed to ensure the mixture was homogenous. For the present study, alkali pulp was used because the mixture produced was much more homogenous than the water pulp. 10% of aluminium sulphate, ferric alum mordant was added to 20ml of dye solution which was mixed with 40ml of paper pulp (paper pulp: dye solution :: 2:1). The mixture was kept standing for 30 minutes at room temperature. The colours obtained were slightly improved but there is scope for further improvement. For further improvement 15% acetic acid was added in the paper pulp & dye solution mixture, (2:1) with 10% aluminium sulphate as a mordant . The mixture was kept for 30 minutes at room temperature. This is because it was found that most of the flowers showed better exhaustion in acidic pH. However, in the case of balsam, 10% alkali (NaoH) was added in the dye bath as balsam showed better exhaustion in alkaline pH. The colours obtained with these processes were encouraging. For better substantivity of dye on paper, the following procedure was used: The dye bath containing dye solution & paper pulp (1:2), 10% mordant and 15% acid was heated in water bath, at 80oc for 30 minutes. After heating, the dye bath was taken out from the water bath, cooled and kept for ageing for 7 days. The ageing time was optimized to 7 days because after that no further improvement was noticed. The paper made from the paper pulp dyed in this process produced very deep attractive colours which were light fast. All the five chosen flowers showed good substantivity on handmade paper (cellulose) these may be easily harnessed as a potential raw material for naturally dyed paper. The mordents used to improve colour fastness of floral dyes are largely eco-friendly in nature, and thus contribute to controlling water pollution and health hazards created by heavy metals like chromium that are present in synthetic dyes. Additional shades were obtained by using a mixture of flowers such as marigolds, butterfly-peas, balsam, parijat, and China-rose in proportion with the dye liquid. Further, the flowers used are cultivated widely and are therefore easily available and relatively inexpensive, facilitating their use for dyeing paper at the level of small and medium enterprises as well as a larger commercial scale. Trotman, ER (1984 sixth edition) Dyeing and chemical technology of textile fibers pp 1-2, 51-52, 54. Ghol, E.P.G et.al (second edition) Textile Science, CBS publishers and distributors. 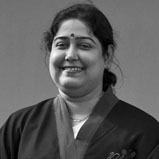 Gulrajani, ML, Varsha Aggarwal et.al . ‘Some studies on natural yellow dyes’ in Indian Textile Journal, vol 102. Dermitrescue, I, E Visileanu, and M Marilena et al (2004) ‘Natural dyes obtained from plant wastes’ in Colourage, vol 51, pp. 121-129. Himani Kapila ‘Natural dyes: Holistic views’ in Convention of Natural Dyes, Department of textile technology, pp 23-27. K. Mazumdar et.al ‘An eco-friendly approach use of flowers as natural dyes for better environment management ‘ in Environment, 93rd Indian Science Congress. Mahale G, Sunanda R.K. and Sakshi et al (2005) International Dyer, Vol 37, pp 46-48. Ingamells, Wilfred ‘Colour for textiles’, The Society of Dyers and Colorists. Needles, HL (2001 First Indian edition) Textile fibers, dyes, finishes and processes, Standard Publishers Distributors: Delhi. Shenai, VA (fifth edition) Chemistry of dyeing and principles of dyeing, Sevak publication.